, one of the most valuable Italian writers of the last century, was born at Bergamo, in the Venetian states, Dec. Js, 1731. He was sent to the Jesuits’ college at Monza; and when his course of education was completed in 1746, he entered into the order of that society. In 1754, when in his twenty-third year, he was appointed preceptor of grammar, and afterwards of | rhetoric, in the college of Brera, in Milan. In that station, in 1755, he republished, for the use of his pupils, the well-known vocabulary of his late colleague, father Mandosio, “Vocabolorio Italiano e Latino del P. Mandosio accrescinto e corretto” and, from 1756 to 1760, he wrote several orations and other fugitive pieces, in which inight be perceived the bent of his mind towards civil and literary history. Of these Fabroni mentions only one as having been published, “DePatriae Oratio,” Milan, 1759. During his professorship he was appointed assistant keeper of the copious and valuable library of the college of Brera, and began to collect original and curious records from printed books and manuscripts. 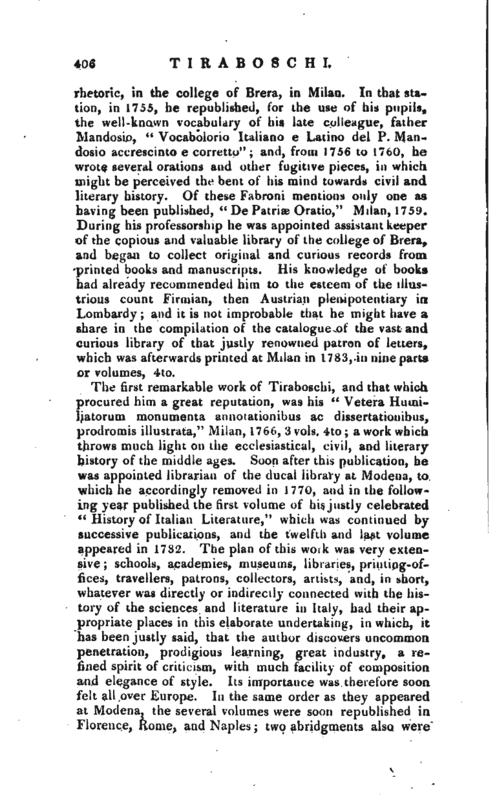 His knowledge of books had already recommended him to the esteem of the illustrious count Firaiian, then Austrian plenipotentiary in Lombardy; and it is not improbable that he might have a share in the compilation of the catalogue of the vast and curious library of that justly renowned patron of letters, which was afterwards printed at Milan in 1783, in nine parts or volumes, 4to. 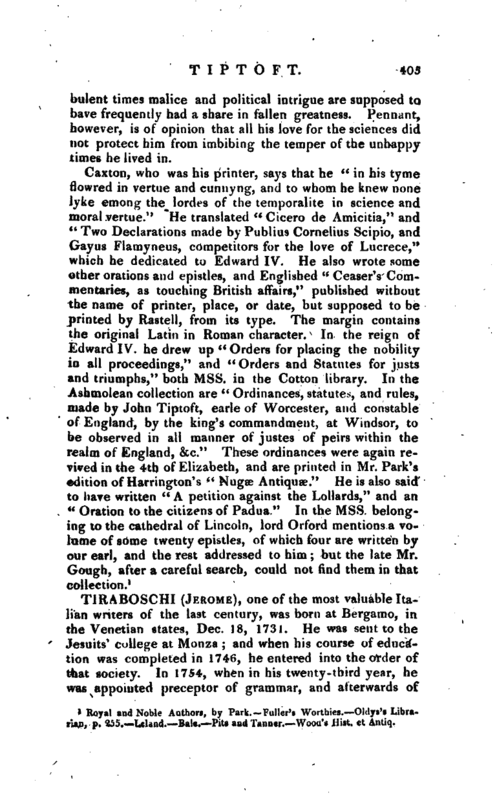 The first remarkable work of Tiraboschi, and that which procured him a great reputation, was his “Vetera H.umiliatorum monumenta annotationibus ac dissertationibus, prodromis illustrata,” Milan, 1766, 3 vols. 4to; a work which throws much light on the ecclesiastical, civil, and literary history of the middle ages. -Soon after this publication, he was appointed librarian of the ducal library at Modena, to which he accordingly removed in 1770, and in the following year published the first volume of his justly celebrated “History of Italian Literature,” which was continued by successive publications, and the twelfth and last volume Appeared in 17 8:2. The plan of this woik was very extensive; schools, academies, museums, libraries, printing-offices, travellers, patrons, collectors, artists, and, in short, whatever was directly or indirectly connected with the history of the sciences and literature in Italy, had their appropriate places in this elaborate undertaking, in which, it has been ju^lysaid, that the author discovers uncommon penetration, prodigious learning, great industry, a refined spiru oi criticism, with much facility of composition and elegance of style. Its importance was therefore soon felt ah over Europe. In ttie same order as they appeared at Motlc-na, the sexcral volumes were soon republished in Florence, Home, and Naples; two abridgments also were | made of the work, one in France, by Landi, another in Germany; and the literary reviews in every part of Europe seemed to want words to express their applause. Among other effects, not very remote, this work has tended to revive, in this country, a taste for Italian literature, which has been successfully cultivated of late years by Messrs. Matthias, Roscoe, and others. Mr. Matthias, it is weil known, has lately republished what regards Italian poetry, from Tiraboschi, in four volumes, judiciously divided into seven chapters the first of these explains the common principles of Italian and Provencalpoetry the second relates the state and vicissitudes of the Provencal poetry from the year 1183 to 1300; the third gives the progress of Italian poetry during the same period; the fourth exhibits its history from 1300 to 1400; the fifth, a similar account of the improvements which took place from 1400 to 1,500; and the sixth and seventh are devoted to the description of the two subsequent periods from 1500 to 1600, and from 1600 to 1700, the latterof which constituted the limits of Tiraboschi‘ s general history. This elegant work is a suitable companion to Mr. Matthias’s former publications, his “Select Sonnets and Canzonets” from Petrarch; his “Lyric Productions of the most celebrated poets of Italy,” and his new edition of Crescembini. Tiraboschi’s work encountered some criticisms during the progress of publication; and it would not be surprizing to find many blemishes in such a vast undertaking. Of these criticisms, where just, he availed himself in his second edition, but entered into no controversy, unless with the Spanish ex-Jesuit Lampillas. Tiraboschi was of opinion, that the Spaniards had been greatly instrumental in the corruption of taste in Italy; and on this principle he had, in his work, severely criticised Martial, Seneca, and Lucan, all Spaniards by birth. 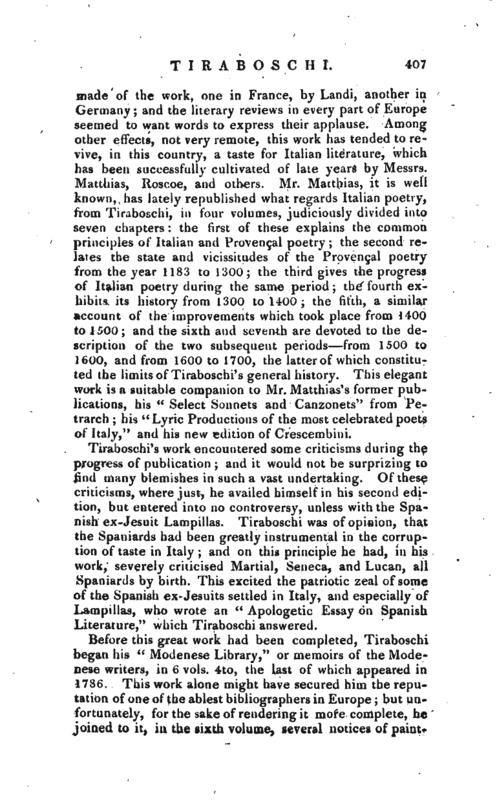 This excited the patriotic zeal of some of the Spanish ex- Jesuits settled in Italy, and especially of Lampillas, who wrote an “Apologetic Essay on Spanish Literature,” which Tiraboschi answered. Before this great work had been completed, Tiraboschi began his “Modenese Library,” or memoirs of the Modenese writers, in 6 vols. 4to, the last of which appeared in 1786. 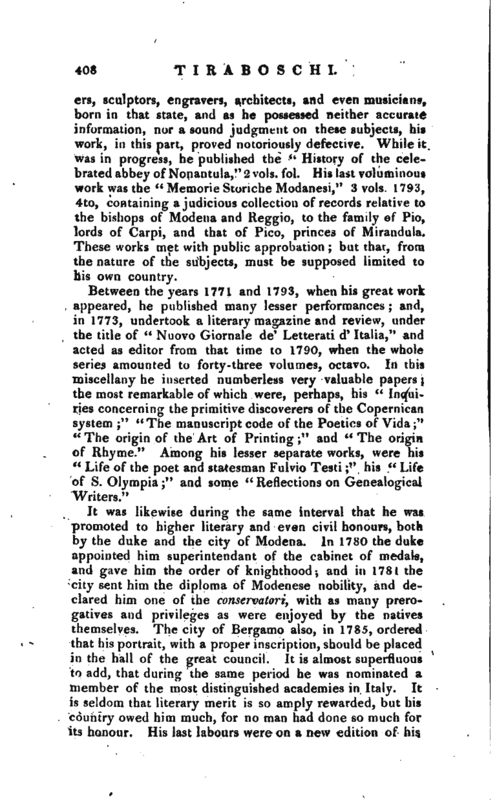 This work alone might have secured him the reputation of one of the ablest bibliographers in Europe; but unfortunately, for the sake of rendering it more complete, he joined to it, in the sixth volume, several notices of | painters, sculptors, engravers, architects, and even musicians, born in that state, and as he possessed neither accurate information, nor a sound judgment on these subjects, his work, in this part, proved notoriously defective. While it was in progress, he published the “History of the celebrated abbey of Nonantula,” 2 vols. fol. His last voluminous work.was the “Memorie Storiche Modanesi,” 3 vols. 1793, 4to, containing a judicious collection of records relative to the bishops of Modena and Reggio, to the family of Pio, lords of Carpi, and that of Pico, princes of Mirandula. These works met with public approbation; but that, from the nature of the subjects, must be supposed limited to his own country. It was likewise during the same interval that he was promoted to higher literary and even civil honours, both by the duke and the city of Modena. In 1780 the duke appointed him superintendant of the cabinet of medals, and gave him the order of knighthood-, and in 1781 the city sent him the diploma of Modenese nobility, and declared him one of the conservatori, with as many prerogatives and privileges as were enjoyed by the natives themselves. The city of Bergamo also, in 1785, ordered that his portrait, with a proper inscription, should be placed in the hall of the great council. It is almost superfluous to add, that during the same period he was nominated a member of the most distinguished academies in Italy. It is seldom that literary merit is so amply rewarded, but his country owed him much, for no man had done so much for its honour. His last labours were 011 a new edition of his | “History of Italian Literature,” published at Modena from 1787 to 1794, 15 vols. 4to, the only one which is novr complete. This immediately preceded his death, at Modena, June 3. 1794, in the sixty-third year of his age. 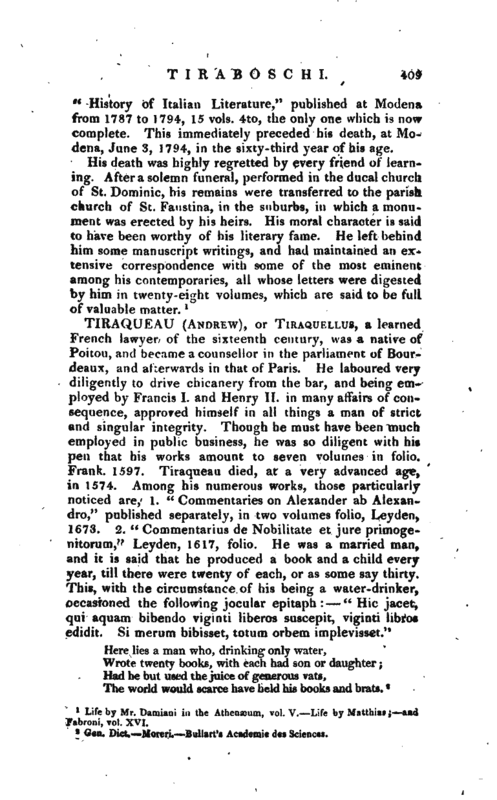 Life by Mr. Damiani in the Athenæum, vol. V.—Life by Matthias and Fabroni, vol. XVI.